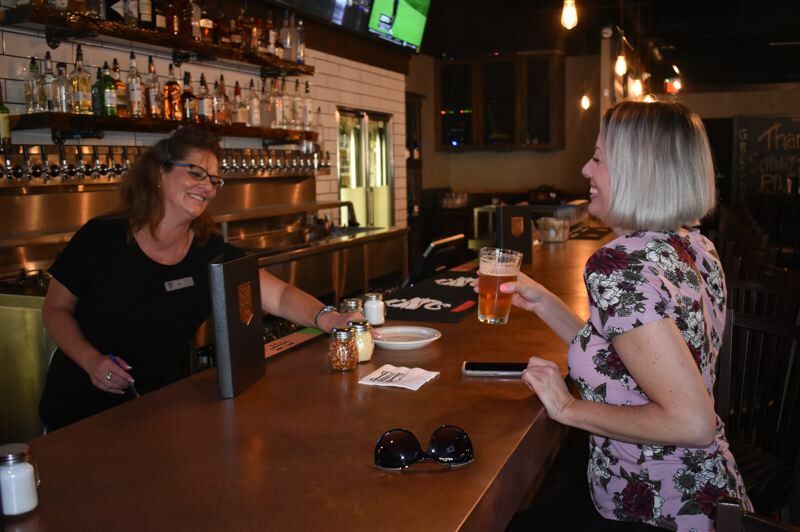 Operating what looks like a large cellphone, servers at the newly opened Schmizza Public House in Gresham can take a food order while the bartender is preparing your drinks. 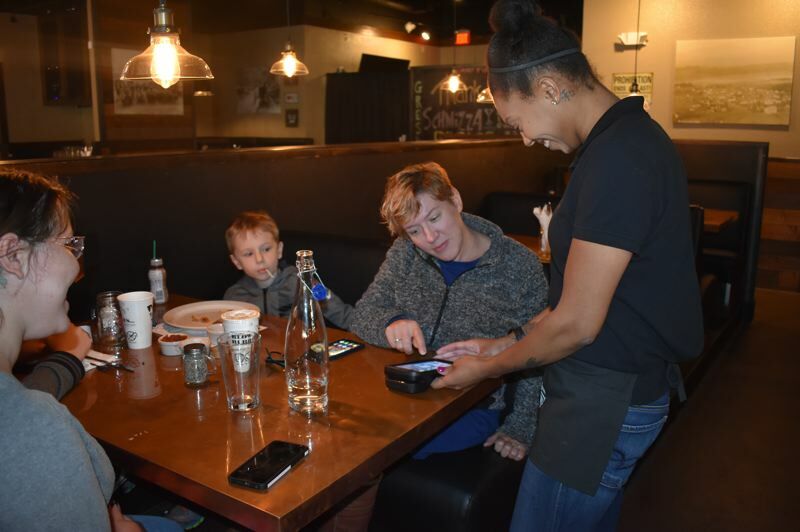 The order goes directly from the server's fingertips to an electronic screen in the kitchen. No notepads. No pens. No memorizing. And no entering the order at a computer station. The result, Schmizza owner Tyson Bafford hopes, is faster, more streamlined service. "We're a 2018 restaurant, so we use 2018 technology," he says. "Our TVs are controlled off a (digital) tablet. The orders go through hand-held devices. It speeds up service and eliminates human error." 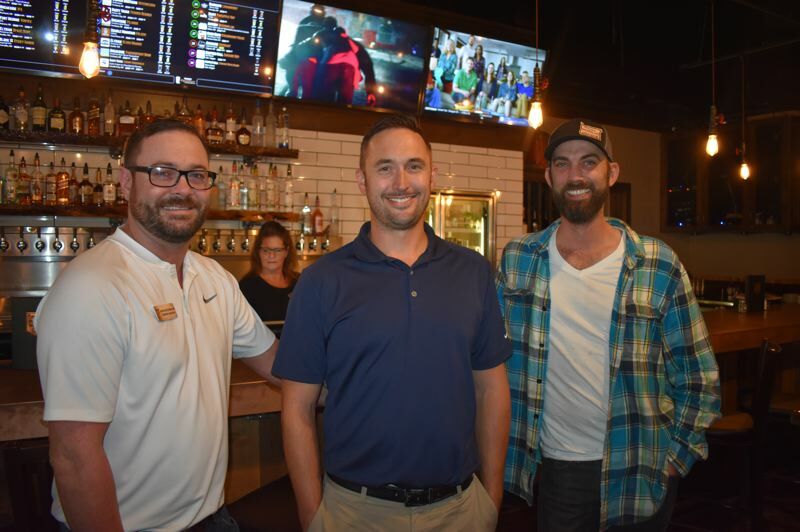 It's that attention to detail, cutting-edge technology and consummate customer service that Bafford believes will make the restaurant-pub a mecca for tasty food and libations, watching sports on TV and experiencing live music with family and friends. After months of delays, the public house opened its doors last week at 850 NW. Eastman Parkway in the former Old Chicago space at the Gresham Town Fair center. "Old Chicago was a pretty successful business," says Schmizza General Manager Mark Buckingham, noting that complications with the lease agreement led to its closing. "We're just a ramped-up, higher-quality version." The spacious, atmospherically lighted gathering place features 30 comfy booths and tables; a long, inviting white tile-backed bar with 30 beer, wine and cider taps; multiple large, elevated TV screens with targeted sound; a blackboard-backed stage area for music performances and magic shows for kids; and a banquet meeting/dining space for groups to reserve. 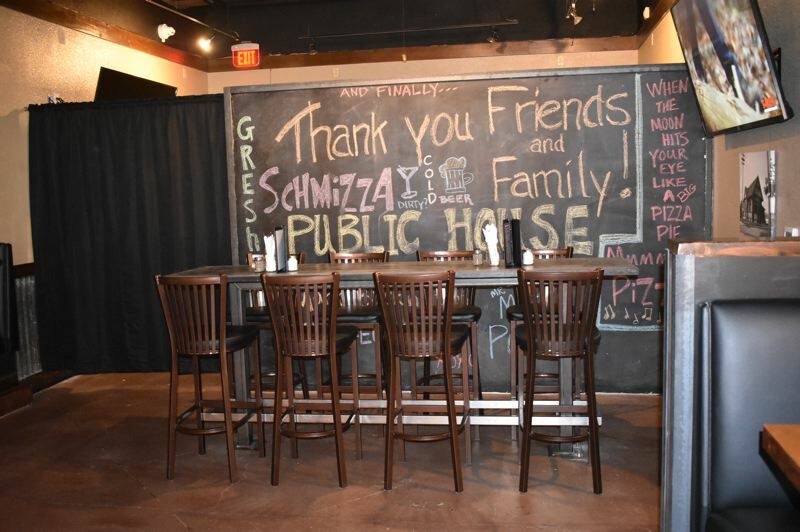 A spinoff of Salem-based Pizza Schmizza, Schmizza Public House is a franchise operation with about 200 outlets around the world. 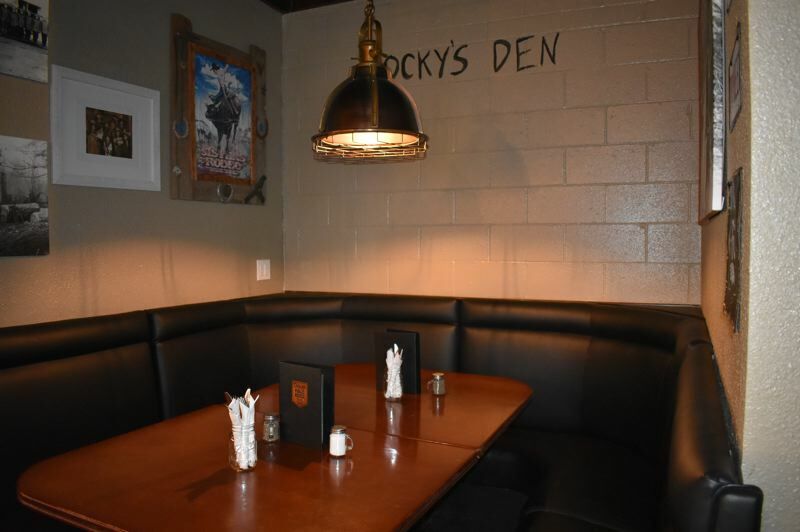 "It's a newer concept," Buckingham says, "a step up from the (Schmizza) Pub 'N Grub. It's a full service, sit-down restaurant." Schmizza's menu — under supervision of Executive Chef Matthew Poynor — covers a lot of ground. Appetizers ($5-$14) range from standard fare like chicken wings, or "Schwings," and pub fries to more eclectic offerings such as seared green beans and beer-battered cheese curds. Pizzas, including a personal size for lunch and happy hour, come as "create your own" or as several specialities highlighting barbecue and garlic chicken, artichoke hearts and sun-dried tomatoes, and spicy Thai and Greek style. Other offerings include burgers, wraps, pasta, tacos, soups and salads. With football season ramping up again, Schmizza's NFL Package promises all games available for broadcast along with breakfast and drink specials on Mondays, Thursdays and Sundays. "We're thinking about a buffet," Buckingham says. As part of the eatery's commitment to sustainability, the lighting is low-voltage LED, and the biodegradable straws are by request only. "We want to be able to offer the guest everything they possibly want," Poynor says, "while being concious of the world around us." 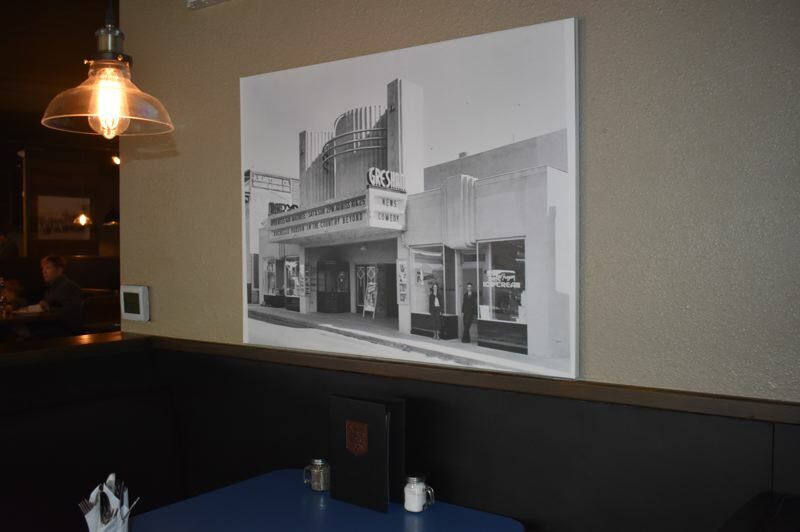 While Bafford and Buckingham secured the space earlier this year, what they call "unforeseen" problems with permitting and city of Gresham codes that changed since Old Chicago's demise delayed the opening until late summer. That said, they credit city building, planning and fire officials with helping them untangle the details. "The city was really good to work with," Bafford says. "(Planning staff) all collaborated to help get us open. This place had been abandoned. Codes changed. No one's been in this building for seven years." "If not for the city's help, we wouldn't be open," Buckingham added. With those pre-opening pains behind them, they're eager to boldy move ahead. "It's a pretty satisfying feeling," Bafford says. "We've been through all the trials and tribulations. Now we walk in and see the fruits of our labors. It's pretty amazing."